The Historic City of Meknes was the capital city for the Alaouite dynasty (17th century). Its Sultan Moulay Ismaïl redesigned the city in Hispano-Moorish style. 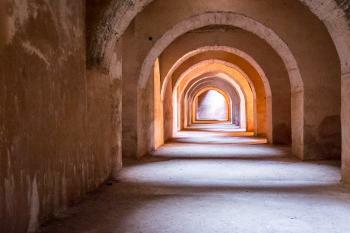 Meknes is enclosed by 25 km long walls that are pierced by monumental gates like the Bab Mansour. 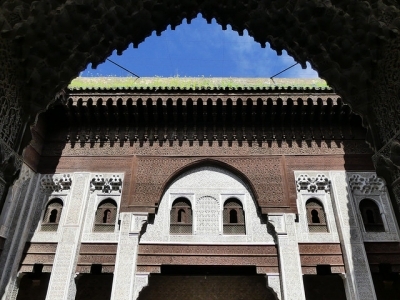 Over 80 monuments are enlisted, including mosques, medresas, hammams and fondouks. I visited Meknes on the morning of the 1st of January, not the best choice of times. The Place el-Hedim, Meknes’s attempt at having their own Djemaa el-Fna, looked desolate (especially under the grey clouds that didn’t want to give way to the sun). The medina was deserted, most of the shops closed. The same unfortunately was true for the Dar Jamaï Museum, advertised by my Lonely Planet guide as “one of Morocco’s best museums”. One might also wonder why this medina has been placed on the List, next to the more mindblowing ones in Marrakech and Fez. You'll get a medina-overdose anyway in Morocco. As I clearly didn't enjoy my time here in Meknes, I decided to skip the royal stables (probably closed too). I travelled on to Volubilis and Moulay Idriss on the same day, both well worth the effort so that I had a fine day after all. I visited this WHS in March 2018. I spent more than half a day in this imperial city and really enjoyed entering the medina from one place and ending up in another while passing through several different passages, roads and alleys and sometimes getting lost. I'm glad I hadn't visited Fes or Rabat before my visit to Meknes as my expectations would have been higher. 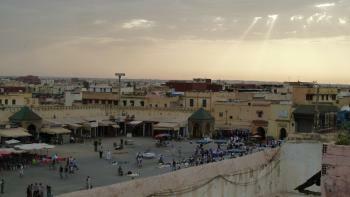 The heart of Meknes is El Hedim (Lahdim) Square which in a way is a minor version of Marrakech's Jemaa el Fna. Tajines, lamps, craftware, clothes, toys, food, orange juice, etc. is sold in this square. Not only will you find sellers but also snake charmers, monkey trainers, acrobats, people with peacocks, camels, ostriches, reptiles or bird of prey to entertain locals and tourists alike for photo opportunities, horse-drawn carraiges, petit taxis, touts inviting people to eat or drink at their stalls, etc. The square is definitely not on the scale of Jemaa el Fna but nonetheless it is very enjoyable and very alive. The views of the square from the cafes with a terrace are mostly worth it for people-watching rather than the food itself. The absolute highlight here is Bab Mansour which is best viewed in the late afternoon when the sun shines on the bright coloured zellij tiles. Directly opposite is the famous Dar Jamai Museum with its splendid exterior fountains. Even though it is worth visiting, don't expect too much if you've already visited other medersas or museums in the other imperial cities of Morocco. I also enjoyed visiting the granaries and the labyrinthine Kara prison if only to cool down from the scorching sun. The one thing not to miss inside the medina proper is the Medersa El Jadida (incorrectly named as Medersa Bouanania) which is considered to be one of the gems left by the Marinids (photo). After visiting the medersa, I ended my visit with a gorgeous view of Meknes from Riad Selma's terrace, sipping mint tea and some delicious patisserie. All in all, I enjoyed my time here but overall I enjoyed all the other Moroccan medinas more. I hadn't heard much about Meknes before I got there but I was really impressed with all the things there were to see. This was once an imperial city and so there are all sorts of grand buildings. However, the most interesting things for me were the place that had particular uses. The first is the old granary which is enormous and I can't even imagine how it would have been filled with food. The other is the old prison which is underground and used to have tens of thousands of slaves all chained up here while they weren't out building the monuments. I stayed for two nights so I had a full day to explore and I'm glad I did. It meant that I could see things at a leisurely pace and also sit in the main square in the afternoon and have a coffee and watch everything go by. I liked Meknes, admittedly I would probably give it the lowest billing of Morocco's four Imperial cities, but I did find it the most welcoming and the one where it felt easiest to get a grasp of everyday life in a Moroccan city. There are a few monumental sites; Bab Mansour being the most obvious, but the imperial grounds behind are certainly worth the time to walk around. We had a rather enjoyable meal overlooking the city walls before heading down to join the locals out for a post fast celebration on Place Lalla Aouda. Indeed the main square Place el Hedim brought back fond memories of Marrakesh. Whilst it certainly isn't Jemaa El Fna it was a welcoming and enjoyable place with a distinct buzz and relatively low hassle value. After our issues with Fez after dark it was really nice to be able to stroll around in a friendly environment and witness locals heading off to the Mosque and bartering in the souqs. We even enjoyed the odd experience of being stranded in the new town as a sandstorm swept through the town, the eerie desolation led off empty streets as dusk set in was certainly unique. Meknes may not be the greatest city in Morocco, however we rather enjoyed its relaxed ambiance and its location close to Fez, Volubilis and Rabat make it a nice easy place to visit; a great place to escape for a more laid back urban version of Morocco. Meknes was an imperial city created by Sultan Moulay Ismael which was never really completed and was then abandoned and partially destroyed by his son in favour of Marrakech. 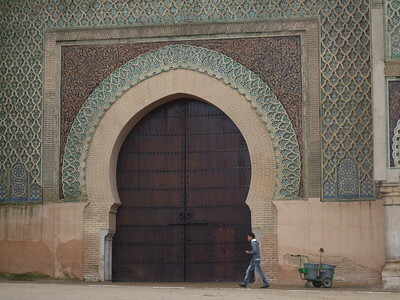 It was built in mid 17th century and has been called (inappropriately in my view) the “Versailles of Morocco” because it was approximately contemporaneous with Louis XIV and his own constructions (Moulay Ismail saw himself as superior to the French monarch and apparently suggested that Louis XIV should convert to Islam and offered to take 1 of his daughters as a wife!). Some of the palace buildings were restored and are used by the current Sultan but much remains in ruins. The walls stretch for miles and the main gate “Bab el Mansour” (photo) whose columns were taken from Volubilis is one of the architectural “highlights” – which perhaps gives you a measure of the “value scale” of what you will see. Inside the walls, the streets and souks are pleasant enough but don’t have the same sense of size and mystery as at Fez and Marrakech – one doesn’t feel “in danger” of losing oneself here!